Nowadays, keeping a lot of files is quite typical in mobile phones. 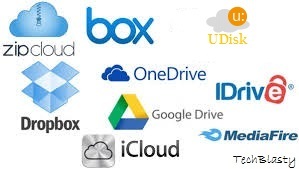 So, to keep a lot of files safe & secure and easily accessible there are many online storage sites. These sites allow you to store plenty of files. There some sites which provide their app also so a user can carry his files on his mobile phone. You can download these apps from your app store. Google Drive provides you to store up to 15 GB online storage space. It provides you to store your photos, document, videos, recordings, and much more. You can access your files from anywhere and with any device. You can also share your files with your friends & family. Dropbox keeps your files safe, synced and easy to share. Save files on your computer and access them on your phone anywhere. Share your photos, videos, and other files to your friend & family. Have you lost your phone ??????? don't worry it keeps your photos, videos, and other files safe & secure. iCloud connects you and your apple device(s) in an amazing way. It always keeps your files such as -- photos, videos, documents, and contacts -- updated on whatever device you are using. It lets you share your files easily with your friends & family. Onedrive helps you to upload your photos and videos so that you can access and share them from your computer, tablet, and phone. OneDrive for Business provides 1 TB of storage for users to manage work files, with the ability for IT to protect important company data. Open Cloud -- Integrated with powerful third-party software to bring you better cloud services.